There was promise of a rocking weekend. But it turned somber. In support of a few friends , who had to battle accidents and ailments , parties were called off and as we sat dwelling on the uncertainties of life , listened to music that went with the mood. It rocked my weekened in its own way and has lingered in my mind since……. Listen to this lovely ‘ghazal’ , a rendering by the legendary Ustad Ghulam Ali Saab. Pours his heart out as he likens his tears to a torrent of rain on a lonely night and chides his beloved that has forsaken him. Taking you along his path of unrequited love in his signature style of combining melody with technique , that quintessential ‘ghazal’ style. Ghazal is a poetic form , consisting of rhyming couplets and a refrain , each line sharing the same meter. And it traditionally deals with one subject : Love. Its either ‘in love’ or ‘out of love’ ! The sublimity of ghazals lies in the poetic expression of both , the ecstasy of love fulfilled or the pain of loss or separation and the beauty of love in spite of that pain ! Unconditional love , celebrated , in other words ! A beloved that is unattainable , a beloved that does not reciprocate the poet’s love or returns it shorn of sincerity , or in cases where society and circumstances do not allow the coming together of two lovers , is the subject of almost every ghazal. And yet , the lover continues loving ……. This ancient form of poetry originated in ancient Arabia and the term ghazal is of Middle Eastern origin. The Sufi mystics and the courts of the Islamic Sultanate introduced ghazals to South Asia in the 12th century. Such intense emotions set to lilting tunes that sometimes wrench your heart and at others lift your spirits glorifying love. As tradition would have it , the poet’s name ( known as takhallus ) is always featured in the last verse , a convention known as Maqta. Now a little about the Maestro : Ustad Ghulam Ali Saab , born on 5th December 1940 ( how privileged am I to share his birthday ) , is an acclaimed Pakistani ghazal singer of the Patiala gharana. The word gharana is traced back to the Urdu/Hindi word ghar , meaning house and typically refers to the place where the particular musical ideology originated. His name Ghulam was given by his father , who was a great follower of Bade Ghulam Ali Khansaab , an unparalleled legend of classical music , hailing from Lahore. Ustad Ghulam Ali Saab’s style and variations in singing ghazals is inimitable , as he blends Hindustani classical music with the beauty of poetry. Add to that the melody of his voice and supreme knowledge of classical music evoking pathos , and the listener could want to be in love ! That is the power of his singing ! He is highly popular in India , Pakistan , Nepal , Bangladesh as well as amongst the South Asian diaspora of the US , the UK and Middle Eastern countries. Indian Hindi film industry , forever celebrating good music , not to be left behind , used some of his hit ghazals in the movies , thereby popularizing ghazals and the Maestro even further. My entire family has been enthralled by his ghazals , so much so that Urdu , the language of ghazals is pursued by most of us in order to understand the deep meanings hidden in the couplets. Such legends are a rarity , salutations to the Ustad for bringing much joy and music to our homes. A teetotaler apparently ( as told to us by him ) who has intoxicated many with his music and an urge to toast a drink or two to the art ! A note of gratitude to my husband , he is the one who introduced ghazals into my life ! Oh how I would love to hear a ghazal live! India is not too far off from you , do visit. 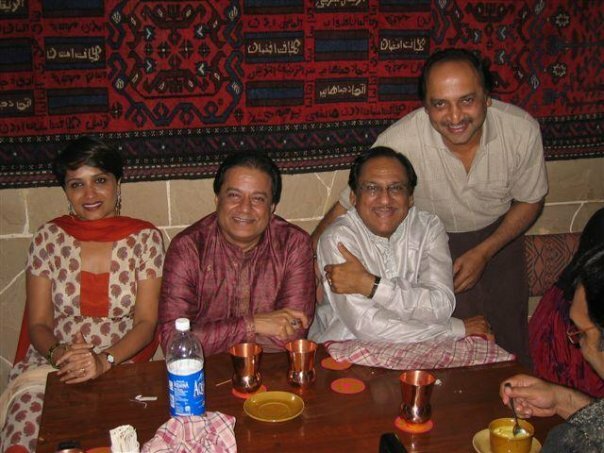 You can find ghazal concerts in some part of India for sure. They keep happening all the time. I am sure Bangkok plays host to ghazals too. Another location close to you. If you wish to hear ghazals , I could send them thru Music Messenger. Instant transfer of any genre of music. See if you can download the app.